SIMATIC HMI Panel PC Ex with international approvals for operation and monitoring in hazardous areas. Effective immediately, the SIMATIC Panel PC Ex will be supplied with a Quad-Core Intel Atom Processor E3845, thus enabling it to offer around four times the performance of the current Intel Atom N270 systems. 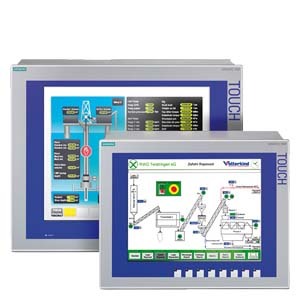 The SIMATIC HMI Panel PC Ex is a Panel PC for use directly in hazardous areas. The device is both an ideal platform for (maintenance-free) embedded applications, as well as a flexible platform for applications under Windows XP Professional or Windows 7. Devices in version "Zone 1"
Device version "UL Class 1, Division 2"
Devices in version "Zone 2"
All dimensions in mm. For mounting cut-out see technical specifications. SIMATIC HMI Panel PC Ex 15"
SIMATIC HMI Panel PC Ex 19"